Clusters of wild hyacinths (Hyacinthus orientalis) greeted us when arriving at the foothill of Mt. Meron. And they kept accompanying us as we climbed up towards to peak (Elevation over 1,200m). This has easily became a favourite hiking trail, which is a satisfyingly challenging two hour round trip (not too long and not too short), and always full of flora and fauna delights. It's a unique mountain because it has many rare plants that don't grow anywhere else in Israel, for example wild peonies. Other plants maybe grow elsewhere but still attract floral pilgrimages that I compare to the Japanese tradition of flower viewing (I already told you about the Sternbergia). 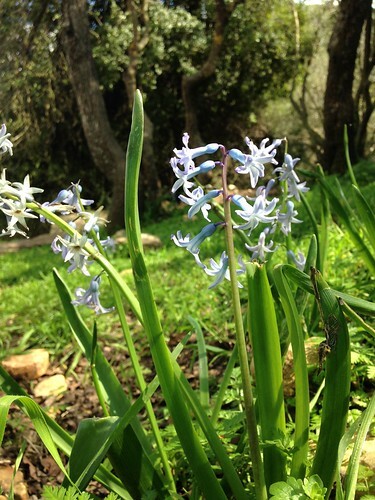 This time I came especially for the oriental hyacinth, the forefather of the cultivated grape hyacinths. I already wrote a little bit about wild hyacinths on this blog, but this is the first time I'm seeing them and smelling them in person. And I was not prepared for their smell at all. Cultivated hyacinths have a sharp green, heady, sweet perfume. Similar scent was observed at the bottom of the mountain - with the hyacinths having the typical green-sharp fragrance, a little sweet and white-wine-like, with forest-floor nuances and more than a sulphuric hint of green onion or chives. On the other hand, the hyacinths on the top of the mountain trail had a surprisingly tropical aroma, bringing to mind lilies and even suntan lotion (!). 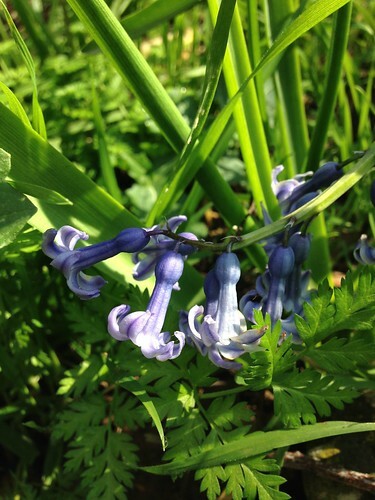 Several molecules were found responsible for hyacinth's character: 3,7 dimethyl-1,3(E),5(E)-octatriene-7-ol (AKA beta ocimene, which has a tropical, green, woody, vegetal scent) and (E)-cinnamic alcohol (which gives it the spicy, floral-green, powdery, balsamic and slightly fermented character), and ethyl 2-methoxybenzoate (AKA benzoic acid or ethyl ortho-anisate, which gives it the fruity-floral aroma, also present in grapes). It must be a different ratios of these molecules that created the difference in the aroma profiles in hyacinths in different location. 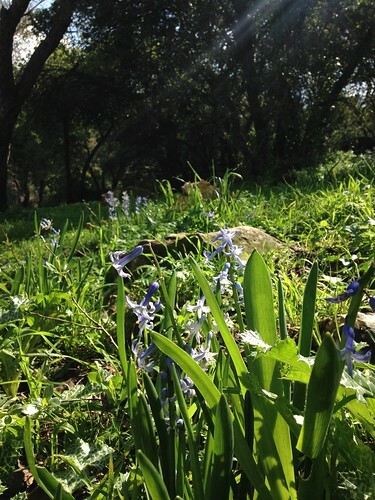 Just a few steps from the first cluster of hyacinths on the trail, a meadow of Syrian Veronicas (Veronica syriaca) ignites the imagination, visually looking like a dream perfume pairing. 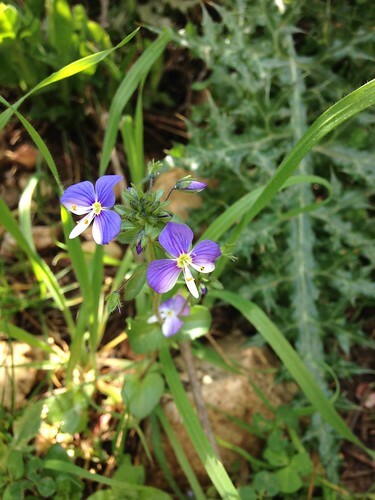 They look a little like violets, with a striking line that separates their blue-purple top from the bottom white colouring. I didn't notice any special smell about them, because I was too preoccupied with their looks and taking pictures of them. They are so delicate and yet outstanding. It's interesting how on the foothill of this mountain, two plants of such different lore grow next to each other: Veronica is named after St. Veronica, who tended to Jesus on the cross giving him a handkerchief to wipe his brow; and Hyacinthus - a pretty Greek lad whose preference of the Sun God Apolo as a lover over the West Wind God Zephyrus brought upon his untimely death. To avoid sending his body to Hades, the Underwold God, Apolo turned his blood into this lovely and fragrant blue flower. 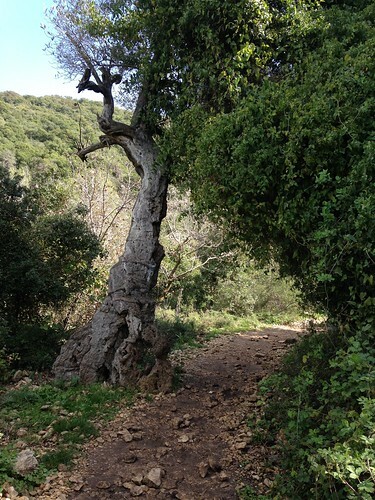 Cubist looking ancient olive tree at the beginning of the trail. 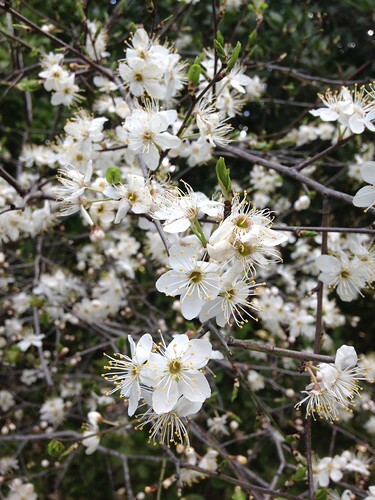 And yet a few steps from there - a wild plum, called Bear's Plum (Prunus ursina), which smells very much like ume (Japanese sour plum), and will ripen sometime during the summer. There was a surprising number of wild plum trees dotting the mountain, which is simply an endless source of inspiration. 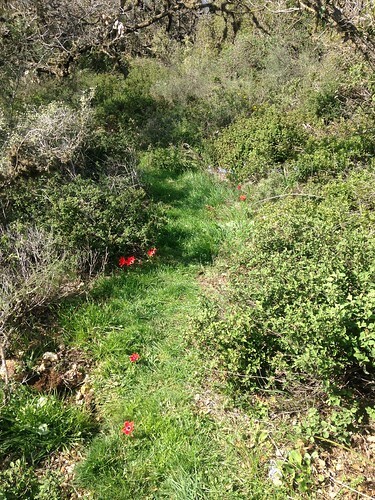 A gorgeous trail of wild red anemones and blue hyacinths higher up the mountain. 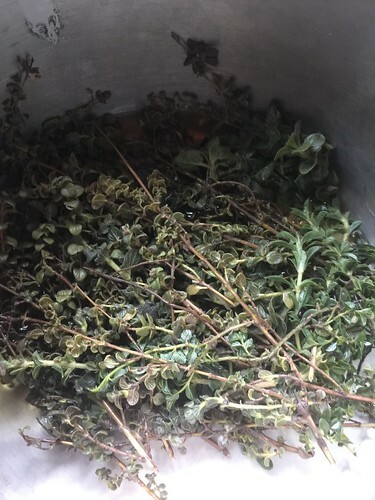 At long last, a new soap is made, and is available online: Za'atar - a melange of wild thyme and oregano from the mountain behind my home, and my garden. Properties; cleansing, disinfectant, anti fungal. 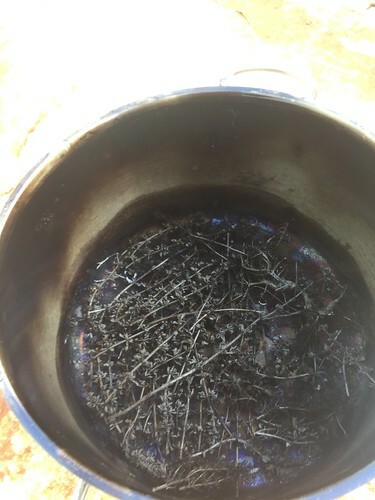 The za'atar soap I've been dreaming of making for 8 months now underwent many obstacles, including me not paying attention and charring the wild za'atar decoction meant for the lye (see image below). Moreover, when I finally made a decoction and that didn't scorch, it was a cold day, ad it took too long to trace and once added the essential oils it congealed too fast. The bars turned out fine but visually are not as consistent and pretty as they should have been - with a texture that shows pockets of oil. 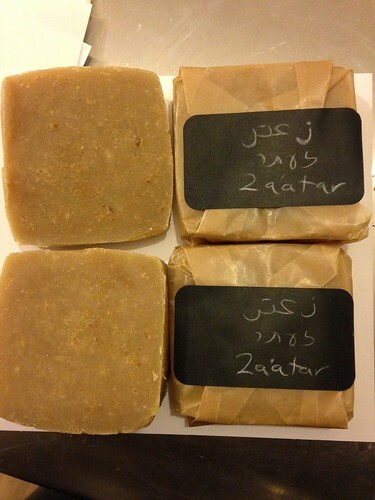 It has a fine za'atar smell, and works wonderfully like all my other soaps though. Welcome to my new home - and thank you for traveling so far to study natural perfumery in my new studio in Clil, Israel! 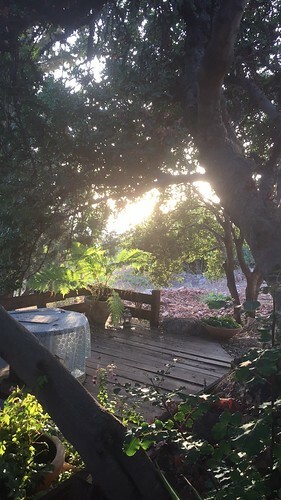 Here’s a brief guide to visiting this tiny and very special country and particularly the Western Galilee and the unique eco-village Clil, where I grew up in from its very conception in the late 1970s. If after reading this little mini-guide to feel that you need any more information or have particular interests questions or concerns - please feel free to contact me via email or phone prior to your visit. The following is written from a local/expat returning home perspective, so it will have information that is likely not found in your typical travel guides. However, it does not replace your own research prior to arrival in terms of all the basic travel issues (valid passport is always a must and some countries required to apply for a visa to Israel as well). So that should be your first step as well as checking currency conversion rates, making sure you have enough money while traveling (Israelis always prefer cash over any other method of payment - and will likely also give you better prices this way; and are still pretty fond of foreign currency, particularly USD; exchange places are very easy to find even in small towns), booking your accommodations in advance, etc. Also, although I do include some general instructions to help you prepare for the weather appropriately - always check the weather forecast prior to arrival in case there is anything unusual. Climate change is a real thing and have created some unpredictable conditions in this part of the world that can surprise us all. These seem like common-sense things to do before traveling, but I’m pointing them out because such preparations will make all the difference in your level of comfort while traveling and staying here. Israel is part of the larger region which was known as the Fertile Crescent - which is the cradle of civilization and where many of the most important plants originated and then spread to the entire world. These include not only basic foods that we can’t imagine our life without such as wheat, olives, grapes, almonds, figs, dates, barley and oats - but also many of the most important perfume materials: rose, jasmine, labdanum, and all of the sage and mint family (lavender, sage, rosemary, etc.). 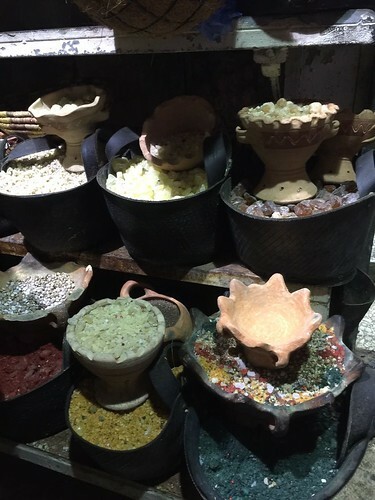 Last but not least - the precious resins that came from the desert trees frankincense and myrrh and are the first perfumes discovered in the world are also from this region. Within that context, it would be curious to note that The Incense and Spice Route, through which the caravans of Arabian merchants that spread precious perfume materials throughout the ancient world, actually passes through this country’s deserts in the south. Israel is but a narrow and not very long stretch of land (about 500km long - not more than half the size of Vancouver Island) - and it takes only 5.5 hours to drive from its northernmost spot (Metula) to the very south town of Eilat, which is set agains the stunning desert and Red Sea, and borders with Egypt (Israel’s neighbour from the south). The eastern border is with Jordan; Syria is at our northeast, and the Lebanese border is on the northwest - only twenty minutes away from our village. Of course the western border is the beautiful azure Mediterranean sea, which has mellow temperatures and can be enjoyed year around - so beach culture here is vibrant and diverse - including swimming, sunbathing, wave-surfing, windsurfing, kayaking and boating. Israel’s location is the key to understanding its unique and diverse character - both culturally, botanically and geologically: It connects three continents - Asia, Europe and Africa - and sits on the Syrian-African Rift which goes along the Jordan river from the Sea of Galilee all the way down to the Red Sea. Within Israel’s alarmingly small area, you’ll find some of the most interesting geological phenomenon, such as the lowest point on earth in the Dead Sea, Makhtesh Ramon - which is a unique geological formation to this area. In the Western Galilee alone you’ll find side by side trees that are pushing their habitat to its extreme capabilities: European trees next to African Savannah bush, and the Sea of Galilee is the most northern freshwater lake that has the African fish Tilapia (here we call it Musht or Amnun). Eilat’s beautiful coral reefs are the north-most tropical reefs in the world, due to unique conditions in that portion of the sea that enable a steady water temperature. Additionally, Israel is a heaven for birdwatchers, with sheer numbers and many species of migrating birds passing its skies every fall. Although it’s a relatively arid region, Israel does experience some distinction between the four seasons, with quite wide temperature range and some dramatic weather conditions such as thunder storms, dusty and strong winds from the east in the transitional seasons, and even snow in some places. On the other hand, it can sometimes get to the low 30s in the late spring and parts of the fall, and summer is not uncommon to get into the high 30s (and even over 40 in the deserts and Eilat). As for the depths of winter - it can get as low as 3 degrees in the winter - and in some areas even to subzero temperatures and regular annual snowfall (i.e. : In Jerusalem and the Judea mountains, and in Mouth Hermon, Golan Heights and Safed). The rainy season here officially spans from late October to early April, with dramatic thunder storms that never last more than a few hours and go on and off for a few days or a week at the most - but also many sunny breaks, sometimes for several days (or weeks) scattered between. It is consistently winter-like (read: cold and rainy) only between December and early March. Because of climate change and the unpredictable nature of weather, it is always best to check the forecast before traveling, and pack accordingly. In terms of area, Israel is about half the size of Vancouver Island, but its population is about the same as in all of British Columbia, and is bursting with universities, research institutions, hi-tech establishments and immense amount of talents in both science and arts. You’ve probably heard some Israeli music at some point of your life - the most influential contemporary and world-renown are Ofra Haza (RIP), Idan Rachel, Balkan Beat Box and many more. Contrary to the international public perception of Israel having two ethnic groups, the population here is far more diverse, as there are many lesser known minority groups and less known religions in the country. Additionally, Jews (who are the sweeping majority now) who came here from all corners of the world brought their culture with them. In the Western Galilee it is particularly felt: just among the neighbouring towns and villages next to Clil, you’ll find five predominantly Druze villages (an ancient monotheistic religion whose prophet is Jethro, and is mostly shrouded in mystery). The largest nearby Druze village is Yirka, which has become more like a town, and is where we do most of our shopping for anything from groceries to clothes to construction supplies; the Bedouin village Sheikh Danoun, several Christian-Arab villages (the majority of the Christians in the country are concentrated in the North and in Jerusalem) - the largest of which is Kfar Yassif; the tiny tourist town of Nahariya was founded by German-Jewish immigrants in the early 20th Century, and near it a village of Ethiopian Jews who came here in the 1990s. Right next to us is a village of Yemenite Jews who brought with them their customs, music, ethnic dancing, beautiful rolling accent and of course delicious food that has become an inseparable part of the culinary tapestry of this country. Visit Carmella for heartwarming Yemeni hospitality, for dance workshops and weave baskets from date branches, and more. You can also ask the local about who to order Jahnoun from on Friday. Many if not most of Israel’s larger cities are cities in which Jews and Palestinians co-exist (Haifa and Akko in the north are prime example for this working out in a most harmonious and respectful manner, and with very little conflict for decades now), and several smaller towns have joined forces to create stronger municipalities with better services and richer culture. One such town is Ma’alot-Tarshiha, a merger of the Christian & Muslim village of Tarshiha with the immigrant town of Ma’alot, which originally was of mostly Jews from Romania and Morocco, and now also has a strong Russian population - which is definitely reflected in the grocery stores and restaurants there. Tarshiha is rapidly becoming a beacon of culinary innovation (more on that later), and wonderful business partnerships between people of various backgrounds. It also runs annual film festival, sculpture festival, and more. The local currency is called New Israeli Shekel (it’s been called like this since the 80s, when the inflation rates were so high it had to be consolidated in a most drastic way - each “new” shekel was in fact equivalent to 1000 of the “old” ones). Each Shekel is made up of 100 “agorot”. Roughy, a shekel is worth about $3.00 CAD or $4.50 USD. But exchange rates fluctuate, so be sure to check online or with your bank before traveling. Prices here are pretty much the same as in Canada or the USA - except that they are in shekels. i.e. : if it costs $6-$10 to buy felafel in a cheap joint in Vancouver, it will only cost you 7-10 shekels here. Food is very cheap and the quality is good especially for produce and dairy, because it is almost all grown locally. There is a mind-blowing abundance of fruit and vegetables year-around, anywhere from tropical fruit to berries and cherries. Arriving in Ben Gurion (TLV airport) and SecurityYou must remember that crossing borders is always a serious matter and you should cooperate with border officials. For obvious reasons, Israel is particularly sensitive about its security - so this is not the time nor place for cynical jokes no matter how tempting. Answer their questions truthfully and matter of factly, and if you face any problems or doubts about the reason for your visit, please give them my full contact info - I can be reached at one of the following two phone numbers: (050) 437-8866 or (050) 437-8867. Of course traveling to Israel always brings the inevitable question of security, and in particular fear of terrorism. The days of suicide bombing are long gone ever since they’ve built the horrid separation wall between the West Bank and the rest of the country. The terror attacks have been reduced to individual violent attacks that are truly no more likely to kill you than any random criminal act in the city. Statistically, it is more likely to be killed in an accident on the road than a terrorist attack in Israel. And most importantly - the areas you’re heading to, as I’ve described earlier, are very peaceful, where people have historically lived harmoniously for thousands of year and have bonded over business and commerce and built strong friendly neighbour relations if not long lasting friendships. This off-the-grid village is solar-powered and has small population of under 1000 people, who live in custom-built homes and semi-temporary dwellings (yurts, teepees, modified train cars and shipping containers, etc.) 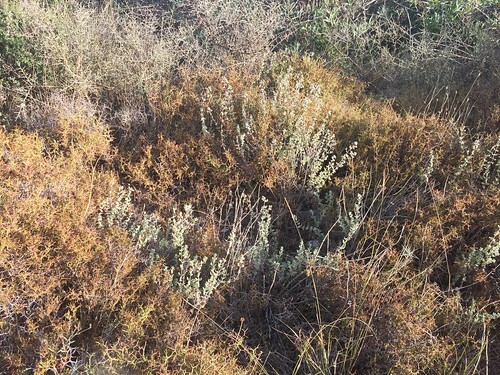 that are scattered among ancient olive groves and wild bush and Mediterranean garrigue (comprising of carobs, oaks, pistachia and thorny bushes). Despite its size, the village is a community bustling with life and culture: our neighbours are the village's cafe (inside a tent) that is opened Thursday-Saturday and hosts live concerts, and there. A large percentage of the population are alternative healers (we're just across the "street" from an integrated holistic clinic offering massage, acupuncture, ayurvedic treatments, and more) as well as creative artists, who have their ateliers in the village - and some would also be happy to show you around - painters, sculptors, potters, glass artists, silversmiths and goldsmiths, basket weavers, etc. The seasons that my courses take place are very pleasant for the most part, so you won’t need to worry about heating (which is mostly done with wood stoves and to a lesser extent with gas heaters). Many food items (fresh organic produce, local honey, tahini, some other dry stuff such as dried fruit, legumes and pasta; eggs, bread, and occasionally goat cheeses) can be purchased in the village, either at the bakery or at the “Organic Garden”, which has become a sort of a convenience store (but is very very small and limited in it is selection). It also sells eco-friendly dish soap and some locally produced soaps, creams, salves and spice mixes. For everything else - I recommend shopping at the nearby Arab or Druze villages which are the closest and have the best prices and services. If you want the most otherworldly supermarket experience where literally everything can be bought - go to Merkaz HaMazon in Yirka (AKA “A Wonderful Market”) and prepare to get lost there for at least an hour. Most of the cabins here do not offer wi-fi. Not only because the population that comes here to be away from civilization as we know it - but also because most have access to wi-fi by tethering with their mobile phone. I strongly advise you to get an Israeli SIM card while here - it may be cheaper than a long-distance data plan from your mobile services provider at your country of origin - but it’s up to you. The Silverman Bakery is owned and operated by the Silverman sisters and is open twice a week (Sunday and Thursday) and offers Pizza Nights on Tuesdays. They bake amazing sourdough breads and and savoury “flutes”, as well as some yeast-dough sweets (cinnamon buns, chocolate rugelach). On Thursday nights you can also find freshly baked Challah for Shabbat. On all other days (Monday, Tuesday, Wednesday), fresh sourdough breads by other artisanal bakeries can be pre-ordered by phone and picked up from the old bakery at the centre of the village on the Pearlman/LeCoultre property (across the road from the playground) or purchased at the local Organic Garden (which tops off their own produce with other fruit and vegetables and organic goodies produced in the village and by nearby artisans). Also less relevant but sometimes handy are the village's book exchange and clothing exchange, which is open 24/7 and is completely free (take what you want and leave what you no longer use - it can come handy if you forgot to bring a hoodie or a book to read). 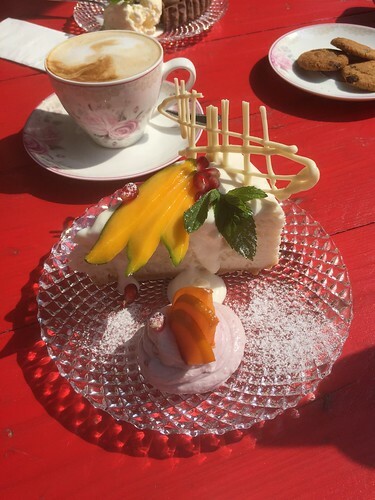 There is one restaurant in the village that is open only Thursday afternoon to Saturday night - Cafe Clil. But also chef Hagit Lidror's Vegan & Vegetarian kitchen (she will be providing most to the catering to our courses, by the way) - which also makes healthy smoothies and mouthwatering raw chocolate treats (she also teaches raw chocolate making workshops!) and several other talented cooks in Clil (Inbal makes breakfast to order) from the Druze villages nearby that can cook you amazing authentic meals and deliver straight to your home. Breakfasts I recommend you cook for yourself - ingredients are easy to get by and all the cabins have well-equipped kitchenettes. You can purchase fresh eggs and produce at the “Organic Garden”, goat’s milk yoghurt and local-style fresh cheeses (like labneh and Cherkesi cheese, which is like a firm ricotta) almost year-around can be purchased directly from Dana Lev who makes it from the goats she raises and milks herself. Her husband Amir Lev is a renown singer-songwriter, by the way. For all other services (i.e. : banking, medical, all other shopping needs, etc.) the surrounding villages and towns answer to all our needs - primarily Nahariya, Yirka and Kfar Yassif. Kfar HaVradim (about 20min away through the backroad) also has a small friendly mall with most amenities. In the unfortunate event when we need health services, there is a regional hospital just outside of Nahariya that serves the entire Western Galilee and is the place to go for emergencies. For less urgent cases, there are doctor offices and clinics in almost all of the surrounding villages and towns, namely Amka, Kfar HaVradim and of course Acco and Nahariya. It would be better to call in advance to be sure that the doctor accepts patients with travel health insurance. Additionally, if you are seeking alternative health services (which, by the way, are formally recognized by the Israeli Ministry of Health and are subsidized by the universal medical plans here), there are many practitioners here in Clil and nearby - offering services such as acupuncture, homeopathy, massage therapy and other healing approaches - all at very affordable rates. There are also a number of physycial therapists practices in the village as well, so if you have an emergency of musculoskeletal nature, you won’t need to go very far to get treatment. And last but not least - preventative health practices such as daily yoga, Pilates, Feldenkrais, martial arts, and other movement classes are offered. Just ask around and you’ll be able to join them as well. While public transit all over Israel is excellent and cheap - it’s most convenient to have your own vehicle while staying in Clil. You can rent one for a pretty good rate via Shlomo Sixt (located behind the train station in Nahariya). Dealers at the airport will probably charge more but are definitely worth looking into. There is also a bus line - No. 55 - that gets in and out of the village. You can find its schedule online. Additionally, the community in Clil has a WhatsApp forum where many people post whenever they leave the village or need a ride out. It can help but naturally you can’t count on the timing to be exactly what you want. Taxi fares are also not too cost prohibitive. But be sure to ask them to turn on the meter rather than set a flat rate fee from the get go (because they usually will try to rip you off when they do that) - unless it’s a rush hour, in which case you probably don’t want the meter running at all. Rate from Akko and Nahariya to Clil should be between 70-100 shekels. Accommodations within the village include one boutique hotel, one guest house (India-style "hostel" on the second level of one of our neighbours’ home - with raving reviews) and countless cute cabins for short-term rent or fully serviced. As far as I know, non is offering breakfast, but do have kitchenettes that you can easily prepare your own light meals. There are also a number of caterers that will prepare you meals to order. All of these cabins have amazing view and surroundings and are cozy and pretty. Sublets among the village's inhabitants are often listed and could be arranged if booked enough in advance, and also near Cafe Clil there is a small campsite, with a yurt and a converted train car that can host up to 6 people, for those who enjoy a fully rustic experience. Last but not least - Meshiv Nefesh - the centre for meditation, also very centrally located, which also has plenty of camping space around it for individuals and groups. If you choose to stay outside of the village - we are only 20-30min drive (depending on traffic) from lovely towns that offer also many wonderful attractions to visitors - i.e. Akko and Nahariya. But take into account that traffic around rush hour is rather slow, so you may need more time (45 minutes and perhaps even up to an hour in some days). The following are links to the accommodations I most recommend to visitors from abroad, as they are the most conveniently located (Less than 15min walk from my studio) I have close relationship with the owners and have personally checked them out for quality and if you mention your name when you book, and make a long term booking, they are very likely to give you a better price than usual. Keep in mind that most places are at full capacity over the weekend, and remain vacant weekdays (which is when you will be staying here). So you are probably going to get a much lower rate for the weekdays part of your stay. If these locations are not available, keep in mind that they are not the only ones and check out Clil’s business website for links to the other ones: Smadar b’Clil , The House in the Olive Grove and Clil Guest House. Last but not least - my brother Yohai next door has a guest room in his home, which has its own separate bathroom and a tiny kitchenette. There are three main religions in Israel - Judaism, Islam and Christianity, and several smaller and less known religions which also have their centres here, for example the Druze, and the Baha’i. The latter originated in Persia, but their most holy site is in Akko - the place where their founder was buried. There is a shrine around it that is open only on some weekends (best to check beforehand) and a geometrical garden planted around it. Another temple is on Mount Carmel which is further south from us (about one hour drive) and has a very different structure and feel. The religions here will affect your stay here whether if you are a believer or not: Each one stays quite true to its origin by closing shop on a certain day of the week. Because there is a strong Christian presence here in the Western Galilee, most places are closed for business on the Sunday. Some of the Druze and Muslim communities around here have also adapted the custom of shutting their businesses on Sundays - so it’s always better to check with the locals before heading there on that day. The Jewish businesses and predominantly Jewish towns (i.e. : Nahariyya) are pretty much shut down (except for some secular restaurants and entertainment) - and in fact, you should know that almost all businesses also close very early on Friday. I strongly recommend you stay away from supermarkets that day anyway, to avoid the rush and stress many families are imposing on themselves - whether if they are religious or not - keeping with the tradition of the big family dinner on Friday night. It’s a Jewish institution like no other - and in Israel it is felt very strongly. Don’t be surprised to find yourself joining a family for one of those dinners - not only because it is considered unfathomable for someone to be alone that night - but also because hospitality is such a strong value in the Middle East and Israeli-Jews are no exception in this area. It’s pretty much the equivalent of a Christmas dinner once a week - usually with blessing the bread and the wine to start, and many courses and much socializing after. There are many other cultural events and festivals to explore, so just ask before your arrival or check out Western Galilee Time’s website for updates about unique ideas and areas of interest. Clil is small, but full of culture: artists’ studios which you can schedule visits to, and even two music venues: Local pub Cafe Clil hosts musicians almost every weekend. Shows happen on Thursday evening (usually around 8pm), some Friday nights (usually at 10pm) and some Saturdays as well (around 6 or 7pm). Here you can listen to up and coming artists and even already famous ones, in a very intimate setting (and the names of the artists is usually kept as a surprise till the last minute, to prevent over crowding of the venue). The other music venues are Ahuzat haShahar (“The Dawn Estate”), which is really a group of stone-built villas that offer accomodation to observant Jews. Located in the Wadi neighbourhood in Clil, which host top-notch concerts with Jewish themed music. Their concerts usually take place on Thursday evenings, around 8pm, but not on a weekly basis. Every Friday night Abaya Winery hosts musicians and serves food right by the ancient fortress in Kibbutz Yehiam. You can go there by car, or take the scenic route on foot - it’s just an hour’s hike up the Yehiam Wadi (dry creek). Just follow the green-white-green markings on the trail. The vintner Yossi Yodfat is our neighbour across the street, by the way. There are countless centres for performing arts as well as festivals, so do some research before coming here or ask me so I can direct you. In the fall there’s a theatre festival in Akko, there is a film festival in Haifa and Ma’alot-Tarshiha as well around this time, and Carmiel hosts a dance festival ever year. There are art galleries, art parks (the one in Tefen industrial park) and gardens (such as the sculpture garden in Kibbutz Eilon), and artists’ atelier scattered all over the Galilee and just waiting to be found. Also there is a growing movement of ethnic home-hospitality where you can experience someone’s original culture with music, customs and food. Such is “HaSuca Shel Carmela” which I have mentioned earlier, Plia (the centre for Buchari Jews) in Kfar HaVradim, and Yonei’s Ethiopean house in Kibbutz Evron, to name a few. Suhila’s (her restaurant is called Abu Suhil) near the souk in Ancient Akko. 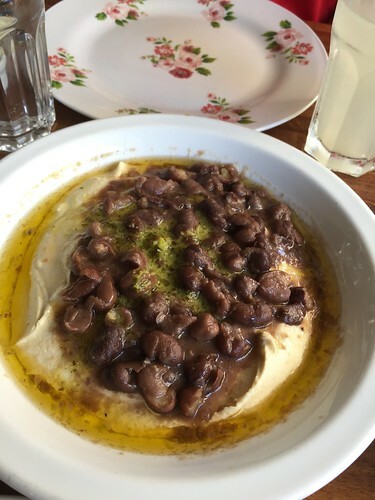 Um Kulthum in Haifa - a modern, Vegan hummous joint that also serves fascinating flatbreads, kibbeh and many other dishes. This is a little far out in the Centre of the Carmel - so only go there if you’re already in Haifa for other reasons. But Israel has more than just hummus and felafel going for it. 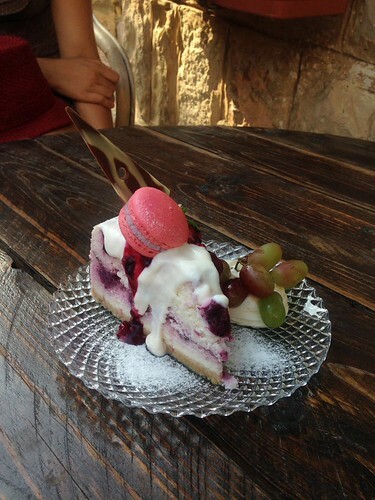 There is a diverse cuisine here and the Western Galilee have become particularly artisanal and crafty. This is what happens when people get along and live their lives - and you’ll see many beautiful collaborations between Arabs and Jews in the culinary world that give more hope than any precious peace initiative. Sawitat also collaborated with Adam Ziv - a young musician from Kibbutz Sassa who was introduced to gelato while traveling in Europe. 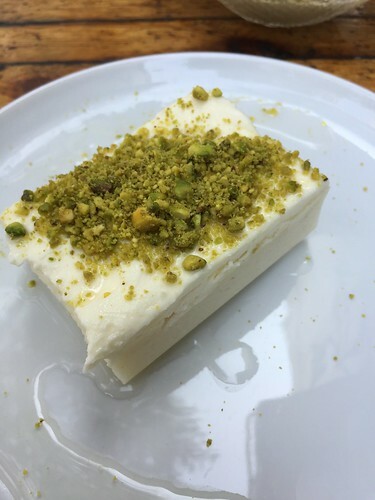 Together they formed the legendary Buza - a top-notch gelato parlour with seasonal flavours from fine ingredients that plays with Middle Eastern flavours such as Halva, pistachio, pomegranate, orange blossom, local fruit and more. You must try Cashewpia - gelato with cashew, coconut and salted caramel. Buza also offers gelato-making workshops in Kibbutz Sassa and has a shop with ice-cream making equipment, kits and raw materials for the budding ice cream maker. gelato will blow your mind way. Adelina restaurant in Kibbutz Cabri is also a fine dining restaurant with Spanish influence. For reservations call +972-4-952-3707. Pizza night at Silverman’s bakery every Tuesday and is really, really, really good. They also serve salads there. Pizza Palla in Yirka, which also serves pasta and salads in an upscale diner-style environment. Pizza Fornetto makes top notch wood-fired pizza - and also is a fully fledged Italian bistro albeit very laid back - which their location calls for - they’re in the gas station near Kibbutz Gesher HaZiv, just across the road from Achziv National Park Beach. They recently opened a closer location in Beit Ha’Emek (a kibbutz about 15min from Clil). Also in Gesher HaZiv is an amazing bakery called Lehem Tene, which serves great coffee and the best croissants I’ve had here, and are arguably make the best sourdough loaves around (try their polenta bread, and cranberry-walnut loaf). Since bakeries were mentioned, there is also one in Beit Ha’Emek. I am a fan of their pastries - namely the poppyseed tart and vegan chocolate chip peanut butter cookies. They are where the old laundry facilities were before, so you would also soak up some authentic Kibbutz atmosphere while you sip your coffee there (which they also serve). And maybe you’ll find a pastry you like better than the ones I mentioned. Breakfast bouffets at Brioche cafe and bakery in Nahariyya are served well after lunch hour. The location is off the beaten track in a residential neighbourhood. This is Israeli breakfast at its best. They also serve lunch if you arrive later in the day - and their sourdough breads are fantastic. Boker Tov (Good Morning) Restaurant near the last station in the entrance to Yirka is also highly recommended. A friendly hummous and beyond joint that is the Middle Eastern answer to North America’s greasy spoon. Cafe Greg in the “Big” mall in Yirka is also known for its elaborate breakfast and the coffee there is good. If you want sushi or Asian food, there is Pandalina - a Japanese fusion restaurant in Kfar Yassif that is owned by hipsters who accept nothing but cash; and the “HaSushiya” - an Asian restaurant near Buza gelato in Tarshiha (not great but okay if you really must eat sushi). Tarshiha is also home to several beautiful bakeries including the famous The Good Bread Bakery near the same area; and a the wonderful pattieserie Sweet Cup Bakery, which is tucked away in the old pebbled streets. Watch out for tobacco curing on the root in the late summer and during the fall season. 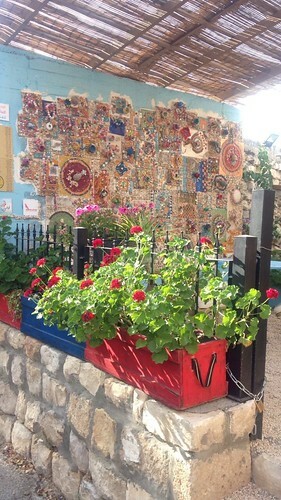 If you drive further on the road connecting you back to Kfar Vradim, there is a strip mall on the right side, where you can also find Noalush, a well respected artisanal pastry shop and cafe. Most recommended! But speaking of bakeries again - you should not board a place before you had kunafeh at Al Walid’s oriental patisserie in Kfar Yassif. His baklava is also to die for and his ma’amouls are almost as good as mine. And Honey Sweets in Yirka serves some divine Layali Bairut. Aside from traditional dining options (restaurants, diners, etc.) there is a rather strong culture here of homemade food sold form a homemaker directly to her customers. 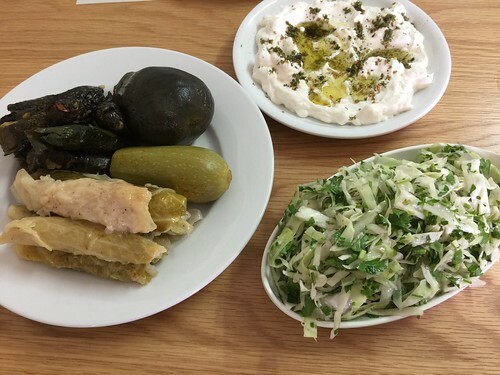 Some have already become established, such as Almansaf catering & restaurant (located at the edge of Yanuh village, just as you exit it towards Kfar Vradim) - their stuffed vegetables are to die for! I highly recommend you try some of the local talents - for example you can order traditional Yemeni breads every Friday from several Yemeni women who keep the tradition alive and ave got us hooked on their cuisine; some of the Druze women from the neighbouring villages also sell their culinary creations for dinners and special occasions, including traditional foods such as dolmas (stuffed grapevine leaves) and other stuffed vegetables, mjadra, and more. Last but not least - Hagit Lidror also creates healthy and delicious smoothies, home cooked meals (breakfasts and lunches especially). There are several wineries and vintners in Clil itself (which I only learned about recently, so haven’t visited yet! ); and one of them (my next door neighbour Yossi Yodfat) runs the award winning Abaya Winery in the nearby kibbutz Yehiam. The first craft beer brewery Malka Beer are also from Clil, and their facilities are also in Yehiam, where they sometimes hold special events and concerts as well. 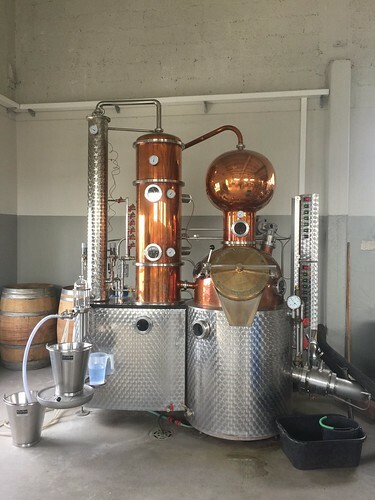 The first craft distillery in Israel is Jullius Distillery, in kibbutz Hanita, right on the Lebanese border (about 20min drive up a pine-laden mountain). It has amazing view, but even more so - an amazingly talented, wildly creative owner and distiller Yuval (“Juv”) - who is innovative and makes pure spirits like no other. Try his Etrog eau de vie, Akko gin (made solely from local plants) and bitters from local botanicals as well. Many other wineries are listed on West Galilee Now’s website, among them I would like to highlight Stern Winery, Kishorit Winery (about 30min drive from Clil) and Lotem Winery (a little further away - about 45min or so). Stern Wintery in kibbutz Tuval grow many of their grapes on location, and create award winning wines that are globally recognized and are on par with Italian, French and Spanish wines. Every two weeks on Friday and Saturday (11am-4pm), they hold a tapas extravaganza at the winery, to which you must reserve a spot in advance. Johnny Stern, the vintner, cooks all the food and his wife prepares the desserts. Kishorit Winery in Kishor (also a kibbutz) is operated fully by persons with disabilities from the Kishorits village within the kibbutz. You’ll be heart will be warmed and uplifted when you meet these people, taking pride in their work and the resulting wonderful wines. They also host events in which they pair their wines with the handcrafted goat cheeses made by their peers at another one of the village’s wonderful endeavorers. Lotem Winery is 100% organic, and although located in kibbutz Lotem, the owners are from Ma’ale Tzvia, an Immen community. True to form, they play classical music to their wines as they age in French oak barrels. And the result is a crystal clear quality that is hard to dismiss. They host many culinary events in the winery, including partnership with their neighbouring dairy, Shirat Roim, for cheese and wine pairing events. I had the honour and the pleasure to partner with them when I co-hosted an evening of pairing perfume and desserts at Smadar b’Clil when the restaurant was still running on one of my visits from Canada (back in April 2015). You can enjoy the many hiking trails in the village all on your own (including one in Wadi Yehiam leading to the medieval citadel in Kibbutz Yehiam) - or hire the local tour guide Yotam Dehan, who knows the place from the day he was born (happens to also be my brother!). There are also trail rides on horses. Thursday evenings there is a little market in the village's playground, weather permitting. Friday there is a mini farmer’s market in the “commercial centre” (Merkaz Mishari) of Kfar HaVradim, where you can find artisanal goatscheeses, baked goods, dim sum dumplings and more. The beaches nearby (only 20 minutes drive) also offer year-around conditions for swimming, surfing, SUP, and sea kayaking. 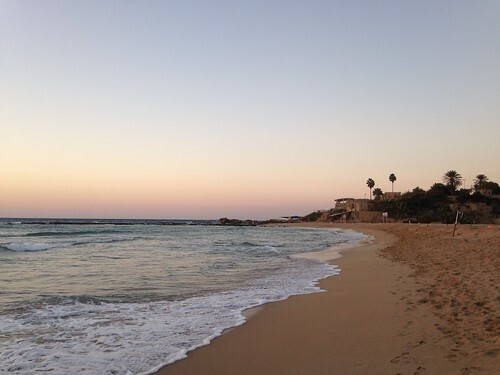 The best beaches in my opinion are Achziv’s Banana Beach, and Betzet. Near Kibbutz Gesher HaSiv there is also a diving club. 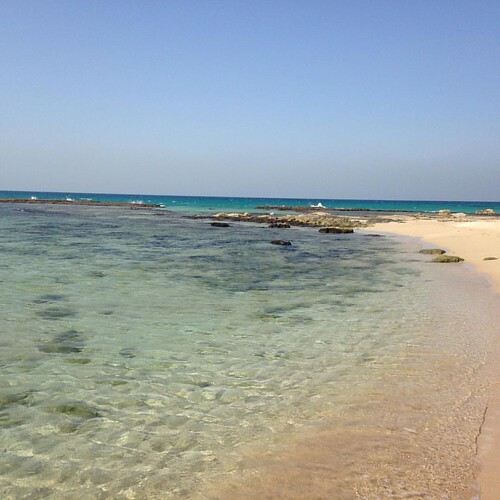 If you’re planning to stay in Israel a bit longer after the course - “Dor” beach is a little further south (after Mouth Carmel), and is also a heaven for beach lovers. 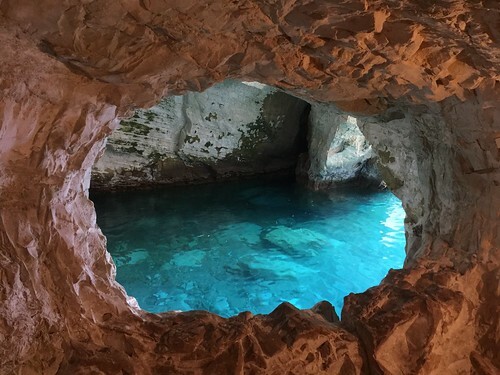 For more details and ideas - visit the regions’ tourism association page, and Rosh Hanikra - the northwest border with Lebanon - has stunning grottos and overlooks the entire North Beach, and is accessible by a gondola that is the most steep (and brief!) ride in the world. You can also book kayaking tours to see the grottos from the inside. 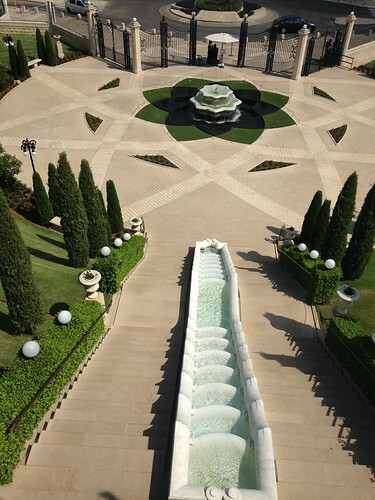 I’ve already mentioned the Baha’i gardens in Akko, but that’s not the only thing to see in this magical seaside city. One of the most ancient cities that is continually standing still, Akko’s Crusaders’ Halls and the entire ancient port have been recognized as UNESCO world heritage site. Its narrow cobblestone alleys, exotic souk and Turkish Bazaar and Hammam are nothing short of magical, and the seawall (literally a protective wall from sandstone that has reliably protected the ancient city from foreign invaders for thousands of years) makes for a romantic evening stall (even if you’re by yourself). 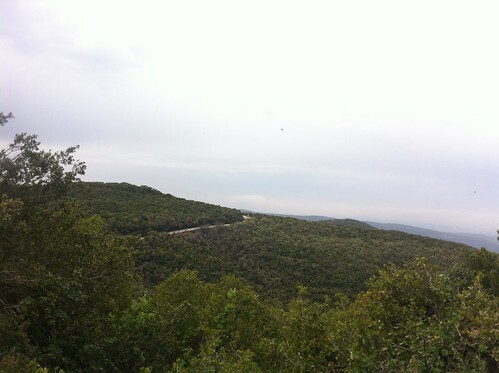 Also close to the border and just 30min drive is Keshet Cave (Arc or Rainbow), which has sweeping view of the Western Galilee, and also offers a challenge for rock climbers and “Snepling" adventures; and Park Adamit near it, including the ruins of an ancient orchard and “Shvil HaBustanim” - a trail that’s been planted with herbs. If you love nature AND ancient ruins, there is a the trail to the Yehiam citadel I’ve mentioned before, as well as the trail in Park Goren that leads to another ancient crusaders’ fort, The Montfort. Thursday markets in Kfar Yassif, a sad remnant to the glory of the old days when this souk was a key point in every household’s weekly grocery shopping; and also a Thursday afternoon market (even smaller) in the village, where locals (including children) sell their wares (anything from pizza and chai that are baked outside on open fire to calendula salves and home baked cookies) and holds bonfire gatherings. Friday mornings till early afternoon there is a tiny farmer’s market of sorts in Kfar HaVradim’s commercial centre, and Saturdays another market is held in Tarshiha’s city centre. If you are a foodie these could be fun, especially combined with other expeditions in the area. Last but not least: If you’re into fitting in a little pilgrimage in your visit, there are countless holy places to all religions within the Galilee, but especially for the Christians: Jesus was conceived in Nazareth, which is only an hour drive from here, and performed many of his teachings and miracles around The Sea of Galilee. We’ve already mentioned the Baha’i temples in Haifa and Akko; and our list won’t be complete without mentioning the picturesque mountainous city of Safed, historically the centre of Kaballah and a now the home of primarily religious community with old synagogues and the surrounding graves of pious ancestors that attract many visitors praying for divine help in their quests. 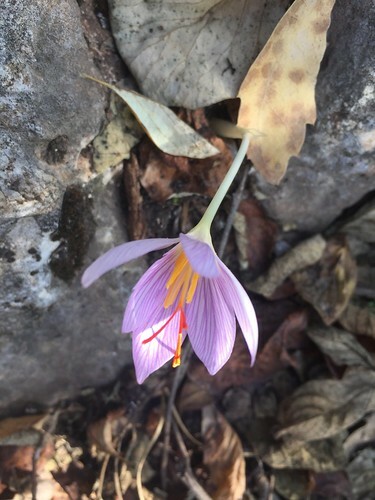 Mount Meron (where Rabbi Shimeon Bar Yohai was buried) is also nearby, which is worth a visit for its beautiful hiking trails, rare bulb flowers (including wild orchids, tulips, crocus and iris) and Cedars or Lebanon. Firs of all - did I mention the beaches? Yes, I know I already did, but I did not mention that the northern-most beach from Medinat Achziv all the way up to Rosh HaNikra is a nature reserve, and makes a great stroll on the sands, with the occasional crawling on sandstone rocks, exploring the beauty of the lagunas and the seaspray vegetation, for watching the surf (which is especially dramatic during the winter months). This nature reserve is only 20min drive from Clil and makes a great afternoon outing, or you can even camp there all day with picnic supplies on the weekend. Mount Meron is the second highest mountain in the country after Mt Hermon (elevation of about 1,200m) and the greenest of all - receiving the greatest amount of percipitation in Israel. 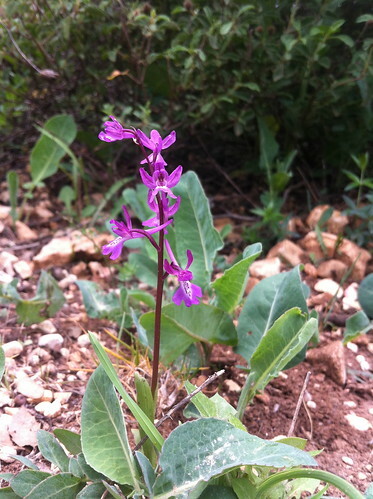 There are rare plants on this mountain that can be seen nowhere else or in very few places in Israel. Among them are wild hyacinths, wild orchids, saffron crocuses (and many other types of crocus), giant yolk-like sternbergias, and even wild peonies! It is also home to rare trees such as Cedar of Lebanon and a local type of juniper. People would travel from all over the country especially to view these flowers when they come out. The mountain is part of a huge nature reserve, and has trails for most abilities and energy level - if you’re tired (or lazy, or have kids in tow) - drive straight to the peak, and walk the trail circumventing the top. There are also several trails from the bottom of the mountain all the way to the top (my favourite is the one leading from Humema ruins, going all the way up and down takes two hours and is a breathtaking path, pun intended); there are trails in the surrounding wadis (dry creeks) and more. Another great hike nearby is to Kziv Creek. There are several trails - one of the easiest is from Hila to the Monfort (an ancient medieval fortress built by the Hospitaler order), both the trail and the fort are wonderful. Another one is from the same location down to Ein Tamir, a more difficult trail (alternating constantly from uphill and downhill), and ending at the bubbling brook with cool pools and little waterfalls, vegetation of Syrian Maple and all around wonderfulness - especially in the hotter months, because the trail is mostly in the shade of the Mediterranean forest of arbutus, oak and carob trees. Another relatively shady and easy trail is across Park Goren, which I mentioned before. You’ll also find beautiful plants there during the fall, winter and spring months. A more difficult trail there would be to access the Monfort fortress - which takes a minimum of 4 hours (compare to the trail from Hila, which is only a 1hr long circular trail). And I’ve already mentioned several times Yehiam - a kibbutz that is very close to Clil when walking on foot, via the Wadi, and which can also lead you the the medieval Yehiam Citadel. Another easy and fun trail is in the wetlands of Ein Afek nature reserve (about 40min drive from Clil). You’ll also discover there some ancient ruins of a watermill, and more. It’s an easy and very pleasant trail, some of it is a boardwalk. And if you’re there during winter or spring, you’ll also enjoy amazing flowering plants all around. If you want to venture out to see more of Israel’s nearly extinct wetlands (we dried most of them with the assistance of eucalyptus trees which the British brought from Australia - in order to grow agricultural crops and prevent the spread of malaria), you can also visit Shmurat Hahula (which is a longer drive of about 1.5hrs to the Upper Galilee), where you may meet wild animals and water foul; and the Wetlands Botanical Gardens nearby in the Agamon Hahula (truly strange plants grow there). On and of its own, this is not worth the drive unless you also visit other places nearby or along the way - such as Menara Cliffs, and more. 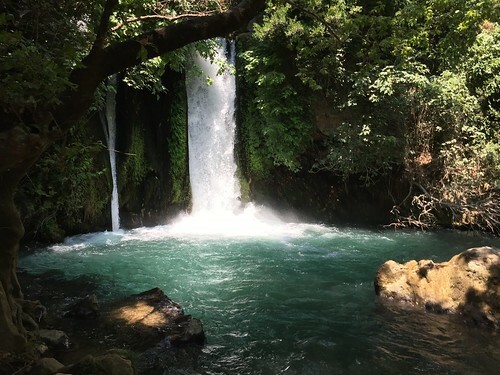 I’ve already mentioned Adamit Park, and I’ll mention it again, as well as the nearby Ein Namer, Betzet Creek, the more far away trails and nature reserve in the Eastern, Upper Galilee, Mount Hermon and Golan Heights (from which I’d briefly mention a few faovuirtes - Nahal Tzippori, Nahal Amud, Nahal Ayun (in Metula - an intenresting border town on and of its own), and the incredible trails of Banias river, where you can also find many ancient ruins, including the Greek temple of the god Pan. Also strong related to perfume, are the ruins of the Nabati towns along the Incense Route in the Negev (Ovda, Shivta, Halutza), and many other things that are further south and a little less known to me but worth explring if you’d like to go on a serious trip after or before the courses you are attending are over. I truly encourage the hikers and nature lovers among you to do some more research because there truly is a lot to see around here! If you are looking for someone to guide you on a fun, tailor-made expedition in the region or anywhere in the country, there are two tour guides I highly recommend and know in person who can do that: Yotam Dehan, born and raised in Clil, and also (full disclosure!) my brother and next-door neighbour. 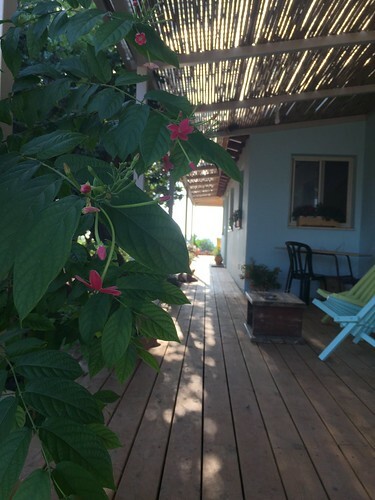 Naturally, Yotam specializes in the Western Galilee and Clil, where he offers tours that brings you inside the homes and studios of locals, and experience the nature through his unique perspective. Ayelet Bar-Meir, from nearby village Kfar Vradim offers unique hikes and tours where you’d meet local creative women in their own home and studio, and explore the natural beauty of the region. The regions’ tourist association’s website. This is where you will find plenty of activities, artisans, wineries, festivals and restaurants to visit on the weekends or evenings during your stay. Ayala Moriel Parfums is also a member there. Valentine's Day is just around the corner, and while for some this is a time for celebration, for others it's a sad time of mourning lost loves or feeling unloved altogether. In this spirit, I bring to you my new perfume < 3. Night was not only equal to the day but also just as warm. Breeze from distant countries brought in the scent of citrus orchards. It was as if we were walking in a rich neighbourhood in west Amman. Or maybe it was the reconstructed remnant of a vintage orchard, blocked in with sandstone and lit strategically with theatre lights, in Old Jaffa. We walked from the top of the hill to the sea and savoured the salted air. We buried our faces in the white blooming foliage of clematis armandii, covering us in a shower of meteorites and drowning our nostrils in their dreamy orange blossom scent. Up the hill again, and in the garden. We sat under the blossoming cherry trees, observing their white petals fall one by one into the black pond. Just as our present moments are disappearing into the bleak past. We will never forget that night. It was equal to the day. Only that after that, the days will begin to lengthen, and we will have to wake up from this dream. Things will become more clear. More real. More light. Lightheaded from gin and tonic, washed down with salty tears of grateful appreciation muddled by the silent anger and deep sadness that is the inevitable realization that what is never will be again. 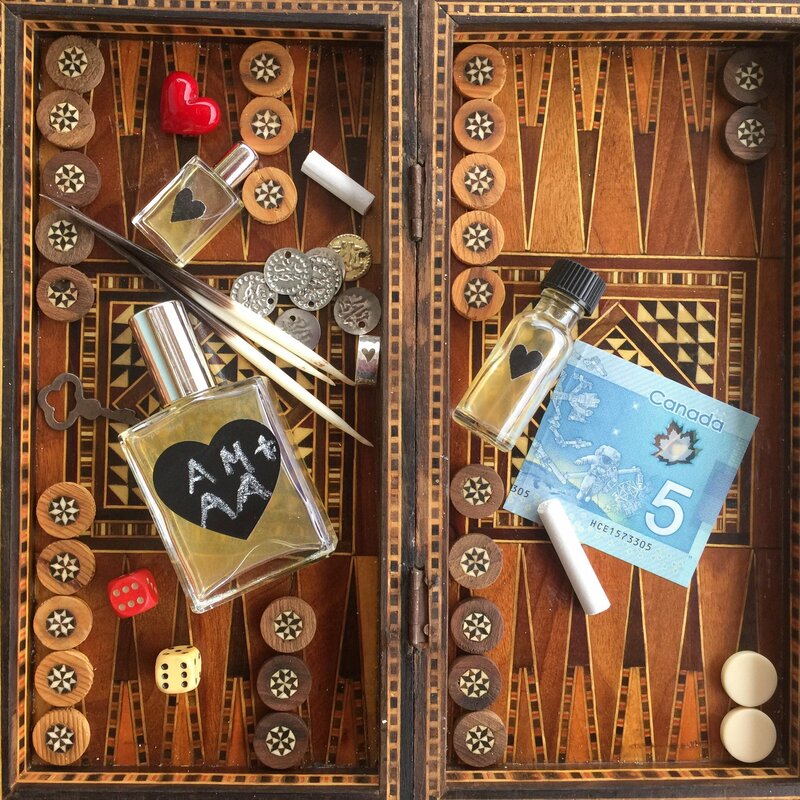 The new perfume is a blank slate in the shape of a hand-cut black heart upon which you write and re-write your lovers of the past, present and future. Looking for a more romantic and less melancholy scents for Valentine's day? Remember that the secret of perfume's seductive power is its ability to make the person who wears it feel good about themselves. Feeling confident brings out the best in you and attracts the right lover.